I love chicken. I love spinach. I love tortillas. And cheese, oh how I love thee. Put it all together…and droooooolllllll………. Dice the grilled chicken breast and quarter the cherry or grape tomatoes. In a large mixing bowl, toss the diced chicken, quartered tomatoes, baby spinach and Wisconsin Queso Quesadilla Cheese. 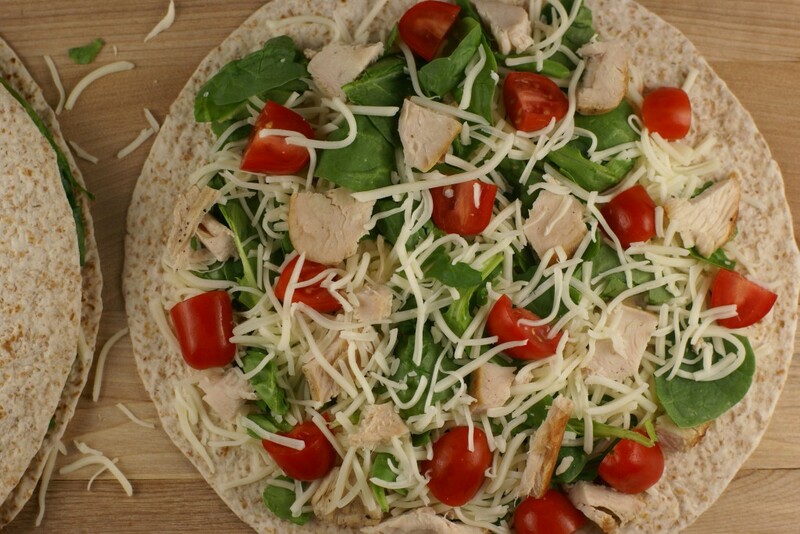 Lay out a tortilla on a clean, flat surface and arrange the chicken, spinach and cheese mixture onto the tortilla. 2 to 3 minutes per side, or until cheese has melted through. 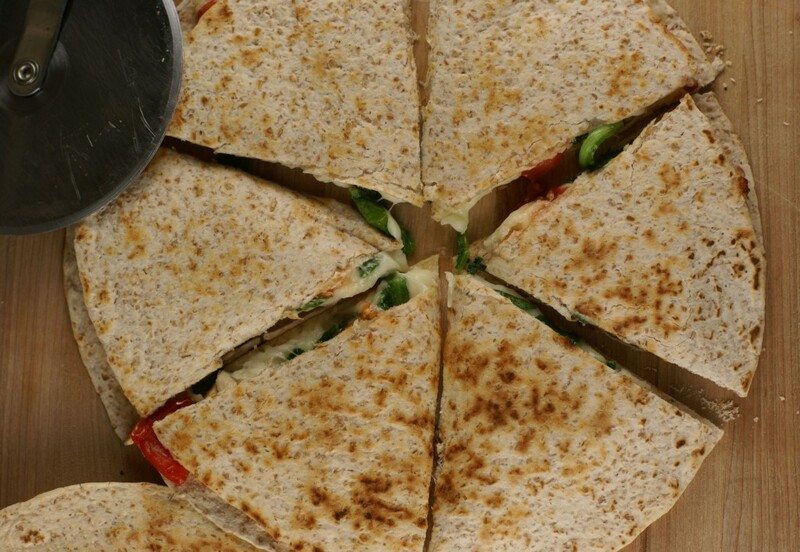 Remove quesadilla from the griddle or skillet and cut with a pizza cutter. Let cool slightly before serving. Serve warm. 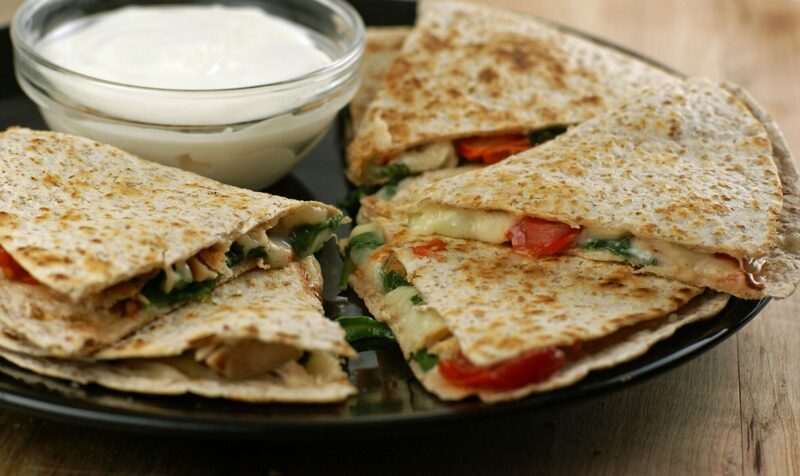 Serve Chicken and Spinach Queso Quesadillas with sour cream for dipping. Note: In place of the quesadilla cheese, you can use shredded Mexican blend or shredded mozzarella as a substitute. Colby Jack is my fav, woohoo! Chicken Q with peppers, and guac, and various veggies stuffed up in there. Good stuff! My favorite quesadilla is chicken and any kind of cheese I can find. Just so it melts all around the chicken, it is good to me! I love all cheese! I have not come across any I have not liked.